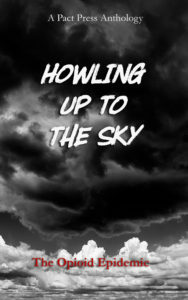 The Regal House Initiative, together with Pact Press, is proud to bring you Howling Up to the Sky, the second anthology in our series designed to spark conversation, promote awareness, and generate funds for groups striving to improve our society. We are proud, through the sale of this anthology, to support the fine work of Shatterproof in assisting families and individuals struggling with addiction. This volume opens with a powerful forward by Catherine McDowell, Executive Director of Roots of Recovery. Ms. McDowell’s insights lead a cavalcade of thoughtful, thought-provoking pieces on addiction, recovery, loss, and hope: essays by Barbara Lodge, Abigail Warren, Sarah Ghoshal, Ken Benson, Anna Schoenbach, Laura Golden, and Alma McKinley; a short story by Jenean McBearty; and poems by Tom Pescatore, Susan Vespoli, Kerry Rawlinson, Edison Jennings, Cynthia McCain, Brian Koester, Jemshed Khan, Justin Karcher, Nathanael Stolte, Damian Rucci, Will Cordeiro, Larry Thacker, and Luke Muyskens. The often-poignant offerings within will change souls and minds, and we hope will move us toward solutions. The release event for Howling Up to the Sky was kindly hosted by Quail Ridge Books, Raleigh, N.C.